The lovely people at Willy Chase’s very kindly sent me a box of goodies to try a few weeks ago. I was over the moon when I came in to contact with them as I am very particular about my Apple Cider Vinegar (ACV), it has to have ‘the mother’ in it and it has to taste good, as I mix it with lemon juice and water and drink it just like that. I usually buy a brand that is shipped in all the way from America which is not so good for the food air-miles, and as Willy Chase’s harvest and produce everything on their farm in Hereford they are practically my neighbour by comparison. When I read their story, it really made me smile. Their passion for their produce shines through in their descriptions and branding and after tasting their ACV and Fit Popcorn I can honestly say I am hooked! I found the Willy Chase’s ACV sweeter than my usual brand, and ‘the mother’ was more evenly dispersed throughout the bottle. It also has a lovely pink hue to it. I used 300ml of the 500ml bottle in the Beetroot & Apple Chutney Recipe I will be sharing as an added bonus at the end of this post and with the rest being used in my healthy tonic drinks I am almost out of the stuff. Fear not, I will be ordering more to see me through the next couple of months! The fit-popcorn comes in 5 lovely flavours and I will list them below in order of my personal preference! Goats Cheese, Red Onion and Thyme – If I had to pick a favourite food combination this would be it and they have captured this brilliant pairing of flavours in popcorn form amazingly well. I know they haven’t, but it’s like they’ve created this flavour especially for me! Apple Cider Vinegar – My nephews helped me devour the larger bag of this and loved it! They are only 6 but quite the popcorn connoisseurs and I quote them when I say “wow this popcorn tastes like salt and vinegar crisps, nom nom nom!” This is actually a very good description of how the popcorn tastes and was followed up by a text from my brother the following day asking exactly what popcorn it was as the boys kept going on about it and wanted it again for Friday night film night! It’s since promptly been added to his Ocado delivery! Well there you go, that’s another bunch of happy customers right there. Salted Honey – I loved this one, it’s made using their own honey made by the bees that pollinate their apple orchards that make the ACV. The sweetness from the honey is perfectly balanced by the added sea salt. My fiancée on the other hand wasn’t as keen, but then he likes his sweets to be sweet and savoury to be savoury. Each to their own and I loved them! Smoky Bloody Mary – They say this flavour was inspired by the perfect Bloody Mary – Chase smoked vodka, fresh ground horseradish and freshly squeezed tomato juice. They’ve certainly succeeded with this and I loved the smokiness that came through. Nearly Naked – This does exactly what it says on the packet, its popcorn in its truest form, with nothing but sea salt added. It’s last on my list purely because it’s not as flavoursome as the others, but if you’re a popcorn traditionalist then this is probably the one for you. So would I recommend this brand? Absolutely 100%! Will I be buying it again? Yes I will! The ACV and my favourite two fit popcorns will definitely be on my shopping list from now on. 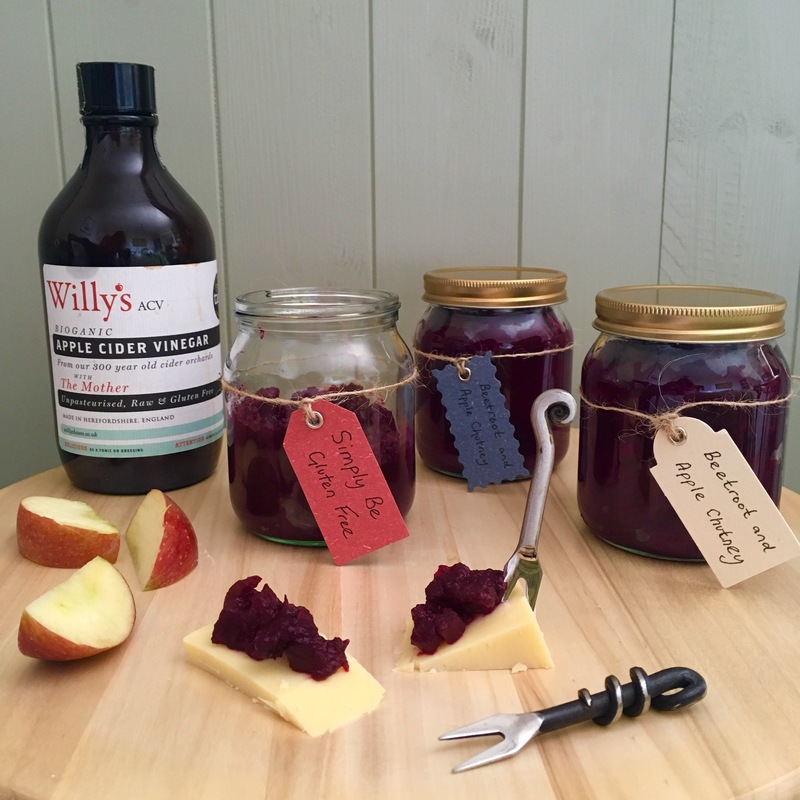 And for those of you that are still reading, here is the added bonus recipe for my Beetroot & Apple Chutney which I made using the Willy Chase’s ACV and homegrown produce from my Dad’s allotment! Place all the ingredients in a large pan and bring up to the boil, cook for 30 minutes stirring frequently but not continuously. Reduce to a simmer and cook for a further 15 minutes whilst you sterilise your jars. To sterilise your jars, preheat the oven to 150.c, wash the jars and lids in hot soapy water and rinse well but don’t dry them. Place the rinsed jars and lids on a baking tray and into the oven for around 15 minutes until they are dry. Once the ingredients have reduced down into a nice chutney texture, fill and place the lids on your jars whilst both they and the chutney are still hot. The chutney can be eaten straight away once cooled but should also last for a couple of months unopened, and then a week or so in the fridge. It’s served best with cold meats or cheeses as part of your favourite ploughmans!